Carly Miller was awarded the Professor Emeritus B. Swartz Scholarship for Excellence in Mathematics. Miller is graduating from Glen Oaks Community College with an Associate of General Studies degree and will begin classes at Western Michigan University this fall. The $1,000 scholarship is awarded to a GOCC student with an outstanding record in mathematics courses. Miller was recommended for the scholarship by Glen Oaks mathematics instructors. Under terms of the scholarship created through a donation by Mr. Bernard Swartz, a former Professor of Mathematics at Glen Oaks Community College, the student must be transferring to a four-year university after graduating from Glen Oaks. The scholarship is intended to assist the student with educational expenses at a four-year institution. 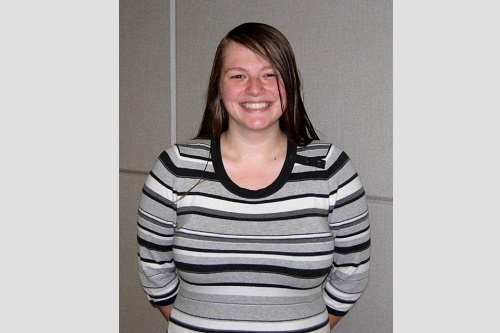 Miller is a member of Phi Theta Kappa, the international scholastic organization for community college students, and was selected for Who’s Who Among American Community College Students. She is a Colon area resident who attended Centreville High School and completed dual enrollment courses at Glen Oaks Community College. After high school she attended the University of Michigan before deciding to return to Glen Oaks and save on expenses. “My aim is to complete my higher education with no college debt. This scholarship will help me achieve that goal,” said Miller.